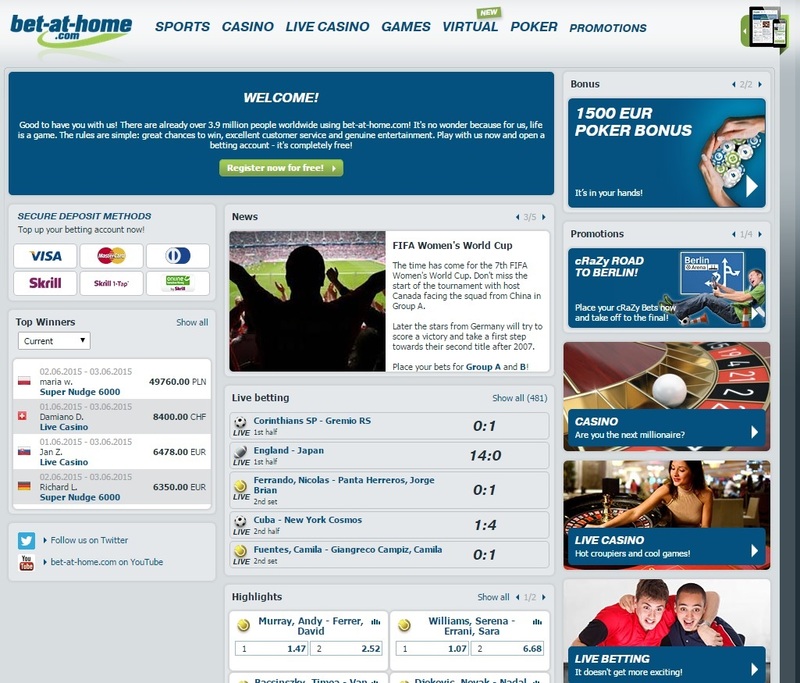 Bet-at-home has existed since 1999 and has since then offered different forms of betting over the internet. Bet-at-home has it’s gaming license in Malta, meaning all your winnings are tax-free. Bet-at-home currently has over 3,9 million users on its site and have since 2014 focused on eSports betting offering. For eSports enthusiasts, Bet-at-home offers bets on a broad range of eSport games. They are currently offering betting on League of Legends, Starcraft 2, Dota 2, CSGO and Hearthstone. To find the eSports section click on “SPORT” and then click “All sports” to get the eSports tab. Like other bookmakers, Bet-at-home offers casino and poker gambling. On Bet-at-home, there is something for everyone thanks to the wide range of selections. Currently, there is no bonus for eSports odds. Instead, a 100% casino bonus and a poker bonus on 1500 euro is offered. However, Bet-at-home has a competition called “Todays Winner”, where they give away 50 euros each day to one of their customers. Even if you currently do not have a bonus for odds it still shows up from time to time. The odds on eSports and the full range of eSports titles makes it worth registering. With the Bet-at-home smartphone app, you can always place bets wherever you are. Thanks to the site being available on smartphones and tablets you can bet real money even if it’s in the middle of an event. To get started just scan the QR-Code that is on their site under the mobile tab or just go to bet-at-home.com/mobile. Currently, live betting is not offered on eSports titles, but you can always keep an eye out on the tab for live games on the site. More and more bookmakers are offering live betting on eSports so it is likely that Bet-at-home will follow. Right now you can only bet on regular sports under the live betting tab. Support is available in several different languages including English. Bet-at-home also has a live chat as well as a telephone support that is available 24/7. Besides offering many safe payment options, Bet-at-Home also has industry grade SSL encryption to keep customer information safe. For people visiting Bet-at-homes site for the first time, it’s easy to get the impression that the design is a bit dull. That is however not a big issue as the site functions correctly and finding what you want is easy. The categories are marked clearly and can’t be missed; there is also a search function. Bet-at-home has sponsored many sports clubs and events throughout the years. Among other things, they have been the head sponsor for 2013 International German Open, also known as Bet-at-home Open. They also arrange tourneys on their site such as the monthly “BETMASTER” in Betmastercup. Bet-at-home has invested a great deal in eSports betting as they offered betting on almost all the biggest and most relevant eSports titles. And If that’s not enough then the fact that they have generous odds on eSports makes Bet-at-Home a betting site we recommend.